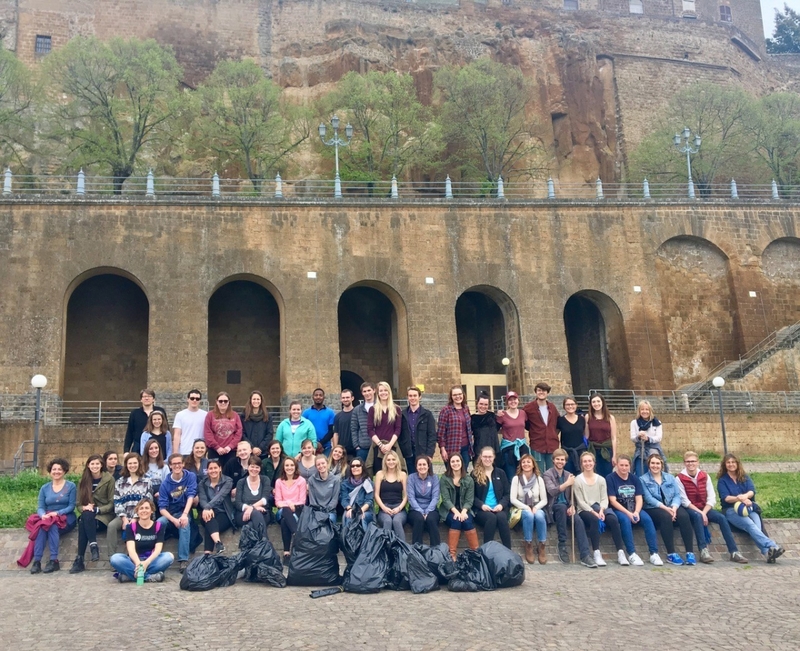 University of Arizona students studying abroad in Orvieto, Italy consider the picturesque hilltop city their second home, and they made a tangible effort this spring to preserve the area surrounding campus. They joined study abroad students from three other universities— Gordon College, Kansas State University, and Saint Anselm College— to pick up trash along a popular trail as part of an event called “Beautify Orvieto.” The idea was born when a city resident noticed trash littering the pathway and enlisted the help of Dr. Claudio Bizzarri, Professor in Residence of the Arizona in Orvieto program. The students gathered in the morning with garbage bags and strolled down the scenic trail, picking up trash along the way. The city’s garbage department later joined in the effort by collecting the full bags. Dr. Alba Frascarelli, Program Manager with Arizona in Orvieto, said the “Beautify Orvieto” event was the talk of the town, even garnering an article in the local news. UA students said they were eager to participate. “Cleaning up the trash not only makes this town more beautiful, but it also gives everyone who calls this town home a chance to make others appreciate its beauty even more,” said Dara Mandell. Arizona in Orvieto is one of the most popular programs facilitated by UA Study Abroad, housed within the Office of Global Initiatives. Just one hour by train from Rome and two from Florence, the quaint city is known for its breathtaking views, warm people, and rich history. Bolstering the study abroad experience, four museums surround the medieval cathedral, holding some of the finest examples of Orvietan art from the Neolithic period to the present day. Arizona in Orvieto runs in the fall, spring and summer. Students can enrich their studies in a variety of disciplines including: Classics, Italian, Art, Art History, Communication, Psychology, Journalism, English, and Architecture.